​as Jesus taught us in the Gospel. Composed of a conglomeration of mission churches (pictured below), All Saints parish was established in Bridgeport, West Virginia, in 1946, with Reverend Charles R. Carroll 1933-1980 as pastor. A chapel in the rectory at 317 E. Main Street served the needs of the initial congregation.A brief review of its history indicates that Father Carroll influenced not only the growth of All Saints parish, but also that of its missions. Following his ordination, Father Carroll came to Clarksburg in 1933 as Chaplain at St. Mary's Hospital, a position he held until 1939. This pastorate included the mission churches of St. Francis Borgia in Grasselli (now Anmoore), Little Flower in Galloway (Barbour County) and St. Joseph in Wendel (Taylor County). In 1938, he was named pastor of St. Francis Borgia parish, which for many years was the principal church under his care. 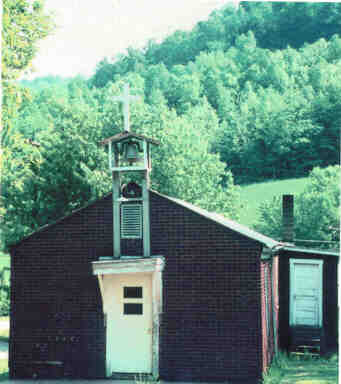 The missions of St. Elizabeth Church in Philippi(Barbour County) and St. Mary's in Rosemont (Taylor County) had been added to his pastorate by 1937. 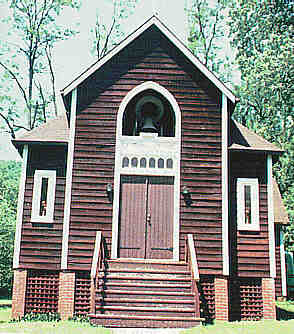 For seven years All Saints was a minor mission of St. Francis Borgia parish. Gradually, All Saints grew until it became the largest church. 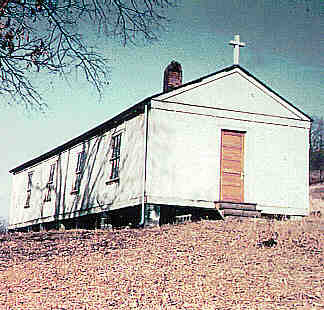 The establishment of Sacred Heart Church in Brownton (Barbour County) brought the number of missions attached to the parish to six by 1953. The Bridgeport congregation was rapidly out-growing its chapel when the Diocese purchased the Methodist Protestant Church (Rachel Chapel) and its parsonage, located across Main Street from the rectory. 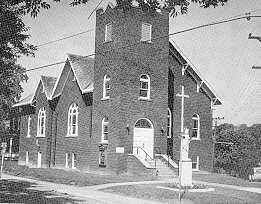 It was renamed All Saints Catholic Church and dedicated on May 16, 1954, with Bishop Thomas J. McDonnell, Coadjutor Bishop of the Diocese of Wheeling, officiating. An elementary school had been established in Grasselli(now Anmoore) in 1934, staffed by the Sisters of St. Joseph. In 1956, it was replaced by a new parish school, All Saints. The faculty of Sisters moved to Bridgeport and the former Methodist parsonage became their convent. All Saints congregation continued to grow and during 1965-1966 the church building was totally renovated, nearly doubling its size. Reverend Hilarion V. Cann 1980-1996 was named pastor of All Saints parish in 1980, with Father Carroll continuing to care for the missions that remained in Anmoore, Galloway, Brownton, and Rosemont. In 1981, a new rectory/administrative office was built on the south portion or the parish property. 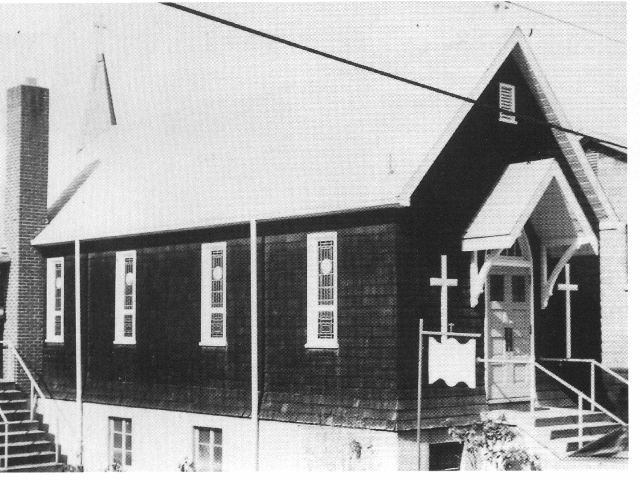 The mission churches were closed in 1982, at the time of Father Carroll's retirement, and their members were invited to join All Saints congregation. In 1983, All Saints School merged with St. Mary's Grade School in Clarksburg. 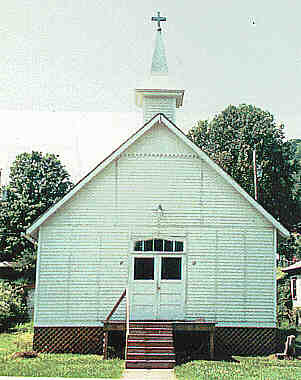 The school building was renovated and continued in use for religious education classes and for various meetings. 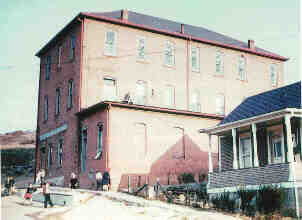 The former convent became Shepherd's Corner, an ecumenical food and clothing distribution center in cooperation with other churches in Bridgeport. Also in 1983, the Diocese purchased the home to the west of the former rectory, which became the residence for the Sisters serving as Pastoral Associates. With the number of parishioners steadily increasing, the need for a larger worship space and related facilities became apparent by the late 1980's. Planning was begun to implement these goals, resulting in the new complex, which, it is interesting to note, is on the site of the rectory/chapel, where All Saints parish was established in 1946. Site work began in April 1991 and Bishop Bernard Schmitt formally dedicated the new church September 27, 1992. 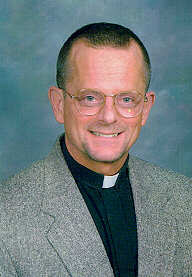 Reverend Harry Cramer 1996-2012 arrived August 20, 1996 from being the pastor at St. Joseph's in Fairmont, WV. He was born in Williamstown, WV and had several assignments before coming to All Saint. Reverend Father Benedict Kapa was assigned to All Saints June 20, 2012 from Fort Ashby and Ridgely, WV. Father Kapa returned to the Clarksburg area where he was the pastor at St. James from 2004 - 2010. By early 1987 it had become clear that the physical building of All Saints was no longer adequate. The needs of its 650 families for religious education, worship, and social activities had simply outgrown the capacity of its facilities. The Parish Council then embarked on a gradual path to a new building. Following an interview process Clint Bryan and Associates, of Charleston, West Virginia, was selected to provide architectural services. Willy Malarcher, of Englewood, New Jersey, was engaged as liturgical design consultant. That spring several moves were made to involve the parish in determining the kind of facility to build. A series of open study sessions, conducted for the parish at large, centered on religious beliefs, liturgy and contemporary church architecture. At the same time, each of the five parish committees was asked to submit a report describing what it would like a new facility to enable it to do. These reports were then combined into the program given to the architect. On the basis of this information a preliminary design was developed. It was submitted to the committees for comment, and then refined. The final design became the basis for a building fund drive held in the fall of 1987. After 4 years of careful planning, the Parish Council decided in January of 1991 to start the actual building. Brothers Corporation, of Fairmont, West Virginia was hired as construction manager for the project. The 1987 design was reviewed, modified slightly, and then refined into construction drawings. A committee was formed to make the decisions and specific design determinations that would be required as construction proceeded. It comprised three persons chosen by Parish Council, the architect, liturgical design consultant, construction manager and the pastor. Site work was begun the first part of April 1991. The old school and former staff house were demolished; extensive excavation began to put the lot into proper shape. Almost exactly one year later, at the Easter Vigil on April 18, 1992 the liturgy was celebrated for the first time in the new building. Even though much remained to be done both inside and out, Sunday Mass has been held in the new worship space ever since, Parish staff moved into its new offices in September, and the outside work, paving and some landscaping were completed early in that same month. Bishop Bernard W. Schmitt formally dedicated the building on September 27, 1992. Reverend Charles R. Carroll was born in Wheeling, West Virginia, on November 25, 1905, one of six children of Dr. John J. and Susan (Riester) Carroll. He attended St. Joseph Cathedral Grade School, Wheeling Central Catholic High School, and graduated from St. Charles College, Catonsville, Maryland, in 1927. He completed his philosophical and theological studies at St. Mary's Seminary, Baltimore, Mayland, and was ordained to the priesthood on June 10, 1933, in St. Joseph Cathedral, Wheeling, by Most Reverend John J. Swint, Bishop of the Diocese of Wheeling, West Virginia. Following ordination, Father Carroll's first assignment was as Chaplain at St. Mary's Hospital in Clarksburg, a pastorate which included the care of the mission churches in Grasselli (renamed Anmoore), Galloway, and Wendel. 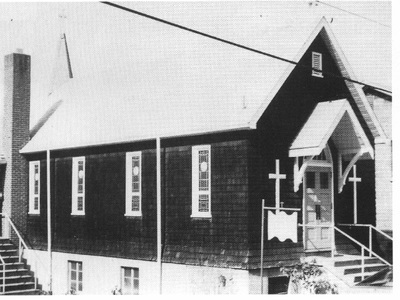 In 1938, St. Francis Borgia mission in Grasselli was established as a parish, with Father Carroll as pastor. One year later, he was relieved of his duties as Chaplain at the hospital to devote all his time to his parish, two missions, and parochical school, which had been established in Grasselli in 1934. Father Carroll moved to Bridgeport in 1939, where All Saints parish was established in 1946. During his pastorate, additional mission churches were established in Brownton, Rosemont, and Philippi, bringing the number of missions attached to All Saints parish to six in 1953. He established another elementary school, All Saints, in Bridgeport, in 1956, which replaced St. Francis Borgia School. By 1980, Father Carroll's health was failing and Reverend Hilarion V. Cann was appointed pastor of All Saints parish. Father Carroll continued to serve the missions that remained in Anmoore, Galloway, Brownton, and Rosemont. After 49 years of faithful service to All Saint parish, Father Carroll retired in 1982. Hilarion Cann was born December 27, 1928, eldest of five children of James and Antoinette (Oliverio) Cann. After returning to the United States in July 1956, Father Cann served in various administrative capacities in Wheeling, holding the office of Presiding Judge of the Diocesan Tribunal from 1956 until 1967. During those years he was Vice Chancellor of the Diocese and was active in the National and Midwest Regional Canon Law Societies. Additional activities included the Diocesan Ecumenical Commission, Office of Appalachian Ministry, Southern Christian Leadership Conference, and others. In 1967 he was one of four religious leaders chosen as "West Virginia Man of the Year" by the Charleston Gazette. In August of 1967 he was appointed pastor of Immaculate Conception parish in Fairmont, West Virginia, where he served until 1969. From 1969 to 1980 he was pastor of Blessed Sacrament parish in South Charleston, West Virginia. He became pastor of All Saints in 1980. Father Cann retired in the Summer of 1996, and currently resides in Bridgeport. ​Harry N. Cramer was born on March 20,1950, in Williamstown, WV, near Parkersburg,WV one of six children of Thomas J. and Martha (Zinser) Cramer. His parents still live in Williamstown and he has fifteen nieces and nephews. His early education was at Williamstown Elementary and High Schools. He attended Marshall University, Huntington, WV where he recieved a B.A. and M.A. in Speech and Language Pathology. He was employed for six years in Mason County, WV, as the County Coordinator of Speech, Language, and Hearing. His journey to the Master of Divinity dgree began at St. Mary's Seminary and University in Baltimore, MD, with one year of Pre-Theology and four years of Graduate Theology Education. His ordination took place on June 24, 1984, at Sacred Heart Co-Cathedral in Charleston, WV. In 1989, Father Cramer was named pastor of St. Joseph parish, in Fairmont,WV which included All Saints mission in Barrackville, WV. He served that parish and mission until August 20, 1996, at which time he became pastor of All Saints parish in Bridgeport, West Virginia. Fr. Benedict E. Kapa was born in Philadelphia, PA on January 1, 1953, the younger son of Benedict J. and Helen V. (Kugiel) Kapa. After attending St. Josaphat Grade School and La Salle College High School in Philadelphia, he earned a B. A. in Political Science at La Salle University in 1975. After receiving a Masterâ€™s of Public Administration from Penn State University, Fr. Benny worked for the Social Security Administration Mid-Atlantic Regional Office for 9 years in various capacities. He began priestly formation in January, 1986 with the Oblates of St. Francis de Sales, studying philosophy and earning high school teaching certification at De Sales University in Allentown, PA. While with the Oblates, Fr. Benny taught Social Studies and English at high schools in Bethlehem, PA, Philadelphia and Fairfax, VA.
From 1990-1993, Fr. Benny pursued theology studies in Washington, DC, earning an M.A. in Theology at De Sales School of Theology and an M.A. in Literature at American University. After leaving the Oblates, he taught Religion at Allentown Central Catholic High School for a year and worked for the U.S. Postal Service in both Allentown and Martinsburg, WV, being an active member of the music ministry while at St. Joseph Parish in Martinsburg. After being accepted into the formation program with the Diocese of Wheeling-Charleston, Fr. Benny finished his theological studies at St. Vincent Seminary in Latrobe, PA, earning a Masters of Divinity in 1999. He then served as deacon and after priestly ordination in June, 2000 as associate pastor at St. Joseph the Worker in Weirton. While in Weirton, Fr. Benny also taught Religion and served as Religion Department chair and Campus Minister at Madonna High School from 1999-2002.